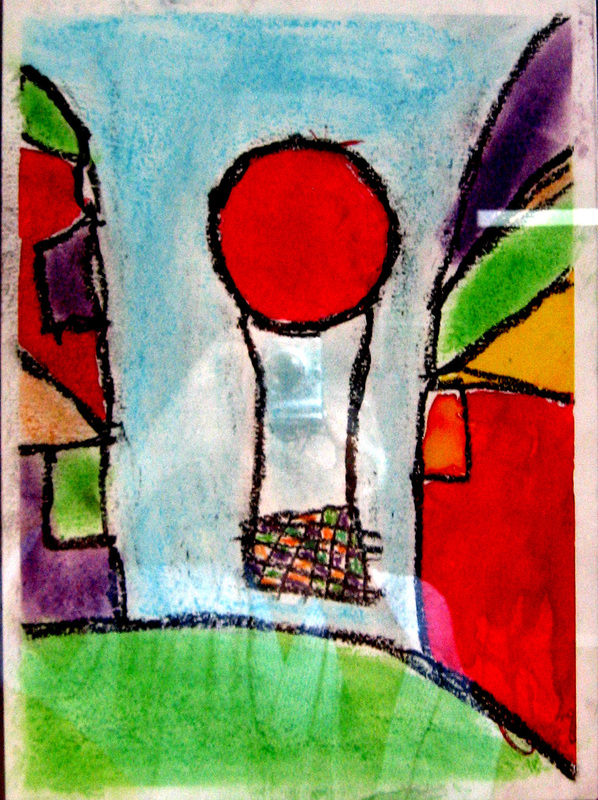 All of us have been delighted and amazed when our wee one brought home school art. Some delight us with the colour and some amaze us with the interpretation of subject. Some display them for the appropriate time or until they are displaced by another equally wonderful picture. Some of us keep them forever. I happened upon this picture when visiting with a relative. 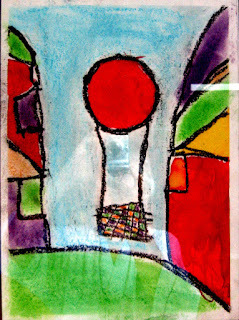 It was crayoned by a 4 yr old and held a place of honour, on the wall under glass. I'm sure you'll agree the colour blocking is wonderful and the lolly pop red of the Balloon and the colours in the basket just draw the eye. So I decided to gift them with my rendition of their grandson's work. The same size,.. 8x12 might be interpreted as a replacement for the original. That's not my intention. This is enlarged to 36x48. With a suitable border it will be large enough to be useful as a lap quilt as they watch TV. The basic outline is very simple so the fabric choices become very important. I tried to use only my own material as some of it had the scribbly and patchy look I wanted to imitate. And seeing as this quilt will be washed I rewashed all my own painted and dyed material with sythropol. Using the master outline I quickly cut the different shapes. The basket material worked up a bit TOO regular, but I can live with that. So here are the colour blocks in place. They're only glued at this point while I decide the rest. I have several choices. I could satin stitch or I could couch some stands of wool in the place of the rayon marks. That's the way I'm leaning at the end of this day.